Show off the most fashionable feet in town with this stylish toe ring! 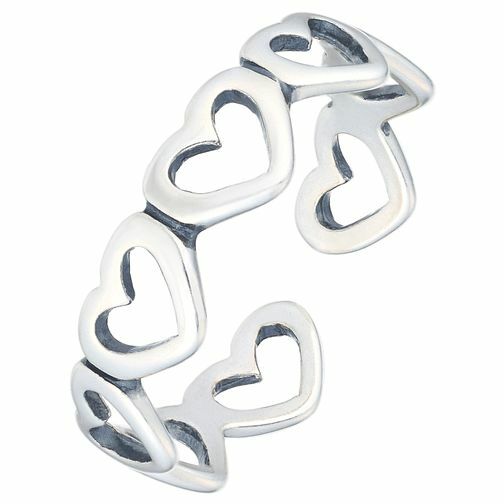 Crafted from sleek sterling silver, this pretty toe ring features an intricate detailed heart design for stand out style! Sterling Silver Heart Toe Ring is rated 4.7 out of 5 by 3. Rated 5 out of 5 by Anonymous from Loverly product Such a beautiful elegant toe ring. Bought this as a present for my mother in law and it was just what she wanted. Couldn't have asked for a better product for the price I paid. Rated 5 out of 5 by Anonymous from Perfect Really pretty little toe ring, comfortable to wear and a perfect summer accessory.